Penn Lines - End Of The Line For Trapping? 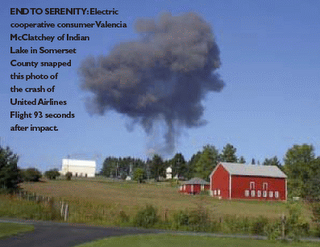 Electric cooperative consumer Val McClatchey of Indian Lake, Somerset County, is selling 8 x 10 prints of her gripping photograph "End to Serenity" (October 2001 issue of Penn Lines, page 14). 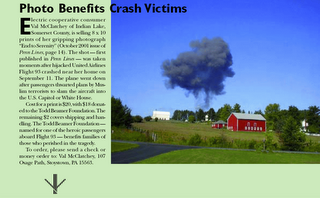 The shot — first published in Penn Lines — was taken moments after hijacked United Airlines Flight 93 crashed near her home on September 11. The plane went down after passengers thwarted plans by Muslim terrorists to slam the aircraft into the U.S. Capitol or White House. Cost for a print is $20, with $18 donated to the Todd Beamer Foundation. The remaining $2 covers shipping and handling. The Todd Beamer Foundation — named for one of the heroic passengers aboard Flight 93 — benefits families of those who perished in the tragedy. To order, please send a check or money order to: Val McClatchey, 107 Osage Path, Stoystown, PA 15563. Notice that in this article, it tells people to make their check or money order directly out to Val and not to The Todd Beamer Foundation as the Shanksville memorial website that advertises Val’s photo says to do. Also, how many people who have gone to the memorial website wanting to buy of copy of her photo have goofed and wrote their check/money order out to Val and not to the Todd Beamer Foundation as it says to? Remember that Val said she uses the “honor system” in forwarding the foundation profits from selling her photo and has admitted to keeping some of the profits to fight her lawsuit battle with the AP. Penn Lines - Can Chestnuts Make A Comeback?